With the preview launch of the PowerShell cmdlets for app creators and administrators, you can automate many of the monitoring and management tasks that are only possible manually today in PowerApps or the PowerApps Admin center. Cmdlets are functions written in PowerShell script language that execute commands in the Windows PowerShell environment. Running these PowerApps cmdlets will allow you to interact with your Business Application Platform without having to go through the admin portal in a web browser. You can combine these cmdlets with other PowerShell functions to write complex scripts that can optimize your workflow. Note that you can still use the cmdlets if you’re not an admin on the tenant, but you will be limited to the resources you own. Cmdlets that start with the word ‘Admin’ are designed to be used by an administrative user account. The default endpoint is “prod”. If a user wants to run a PowerShell script on the USGOV endpoint, the -Endpoint parameter needs to be changed to “usgov”. GCC level 4 and level 5 are not yet supported. If you are prompted to accept the change to InstallationPolicy value of the repository, accept [A] Yes to all modules by typing ‘A’ and pressing Enter for each module. Before accessing any of the commands, you have the option to provide your credentials using the following command. These credentials are refreshed for up to ~8 hours before you’re required to sign in again to continue using the cmdlets. 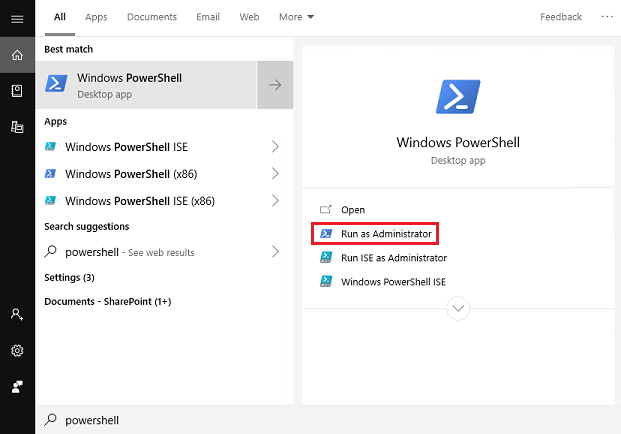 Users with a valid PowerApps license can perform the operations in these cmdlets, but they will only have access to the resources (for example, apps, flows, etc.) that have been created or shared with them. We have updated some of the cmdlets function names in the latest release in order to add appropriate prefixes to prevent collisions. See the table below for an overview of what has changed. A paid PowerApps Plan 2 license or a PowerApps Plan 2 trial license. You can sign-up for a 30-day trial license at http://web.powerapps.com/trial. Trial licenses can be renewed if they've expired. Use Get-Help ‘CmdletName’ to get a list of examples. To cycle through the possible options for input tags, click on the tab key after typing out the dash (-) character, after the cmdlet name. Below are some common scenarios that show how to use new and existing PowerApps cmdlets. Use these commands to get details on and update environments in your tenant. Returns a list of each environment across your tenant, with details of each (e.g., environment name (guid), display name, location, creator, etc). Returns the details for only the default environment of the tenant. Note: The EnvironmentName field is a unique identifier, which is different from the DisplayName (see first and second fields in the output in the following image). These operations are used to read and modify PowerApps data in your tenant. Returns a list of all PowerApps across the tenant, with details of each (e.g., application name (guid), display name, creator, etc). Returns a list of all the PowerApps in your tenant that match the display name. Note: Use quotation characters (”) around input values that contain spaces. Featured applications are grouped and pushed to the top of the list in the PowerApps mobile player. Note: Like environments, the AppName field is a unique identifier, which is different from the DisplayName. If you want to perform operations based on the display name, some functions will let you use the pipeline (see next function). A Hero app will appear at the top of the list in the PowerApps mobile player. There can only be one Hero app. The pipeline (represented as the ‘|’ character between two cmdlets) takes the output of the first cmdlet and passes it as the input value of the second, assuming the function has been written to accommodate the pipeline feature. Note: an app must already be a featured app before it is changed to a hero. You can combine native PowerShell functions with the PowerApps cmdlets to manipulate data even further. Here we use the Select function to isolate the Owner attribute (an object) from the Get-AdminApp object. We then isolate the name of the owner object by pipelining that output into another Select function. Finally, passing the second Select function output into the Group function returns a nice table that includes a count of each owner’s number of apps. The above command will store the PowerApps user details (basic usage information about the input user via their user principal name) in the specified text file. It will create a new file if there is no existing file with that name, and overwrite the text file if it already exists. Changes the owner role of a PowerApp to the current user, and replaces the original owner as a “can view” role type. Note: The AppName and EnvironmentName fields are the unique identifiers (guids), not the display names. Use these commands to view and modify data related to Microsoft Flow. Returns a list of all flows in the tenant. Returns the owner details of the specified flow. Note: Like Environments and PowerApps, FlowName is the unique identifier (guid), which is different from the display name of the flow. Returns the user details regarding flow usage. In this example we’re using the user Id of the current logged in user of the PowerShell session as input. Deletes the details on a flow user completely from the Microsoft database. All flows the input user owns must be deleted before the flow user details can be purged. Note: The UserId field is the Object ID of the user’s Azure Active Directory record, which can be found in the Azure Portal under Azure Active Directory > Users > Profile > Object ID. You must be an admin to access this data from here. Exports all the flows in your tenant into a tabular view .csv file. View and manage API connections in your tenant. Displays a list of all API connections you have in the default environment. Native connections are found under the Data > Connections tab in the maker portal. Returns a list of all custom connector details in the tenant. These cmdlets will control the DLP policies on your tenant. Returns a list of all the policies. Lists the API connections that are in the Business data only(or BusinessDataGroup) field in an input policy. Adds a connector to the ‘Business data only’ group in a given DLP policy. See the list of connectors by DisplayName and ConnectorName (used as input) here. 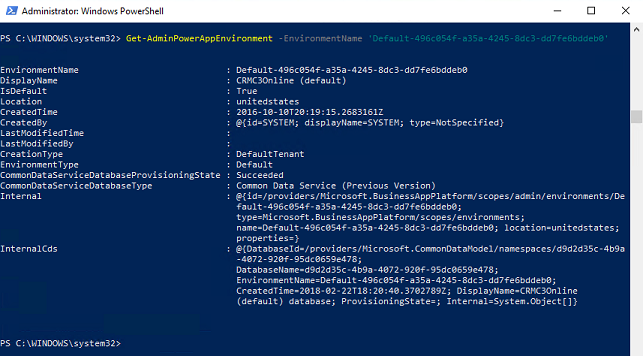 Cmdlets are now available on the PowerShell gallery as two separate modules: Administrator and Maker. If you have any comments, suggestions, or questions, post them on the Administering PowerApps community board.